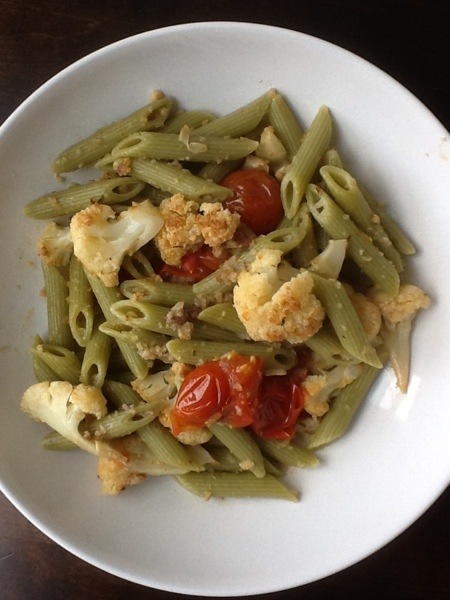 Spinach Pasta with Roasted Cauliflower, Cherry Tomatoes and Anchovies | One Picture, A Million Words. Before I start cooking any meal, I always envision what I want the final dish to look like. With that image in mind, I try to create what I have planned. Very often, I pay particular attention to the colours of the dish because I like my food to look pretty and the more colour, the prettier the dish. I place a huge emphasis on how my food tastes and looks because I find that my kids eat with their eyes first. If anything looks remotely yucky and offensive to them, they will not allow a morsel of it to pass their lips. I suppose that holds true for most people. Tonight’s pasta had the tricolore of the Italian flag – green, red and white. Green from the perfectly al dente spinach pasta, red from the slow roasted cherry tomatoes that I left whole to contain their juices, and white from the roasted cauliflower florets (they actually turned into an enticing gold after roasting). I doubled the amount of anchovies I usually add to my pasta and that in turn doubled the umami deliciousness of the dish. Comfort in a bowl – that is what a bowl of pasta is to me and my daughter.